Following your decision to publish in the Guardian the inflammatory, Islamophobic and deceiving ad written by Elie Wiesel, I decided neither to buy nor to subscribe to the paper from tomorrow (I have been a regular reader until today). Your coverage of the barbaric and cruel Israeli onslaught on Gaza has been actively pro-Israeli with the exception of the excellent (but rare) articles by Seumas Milne. 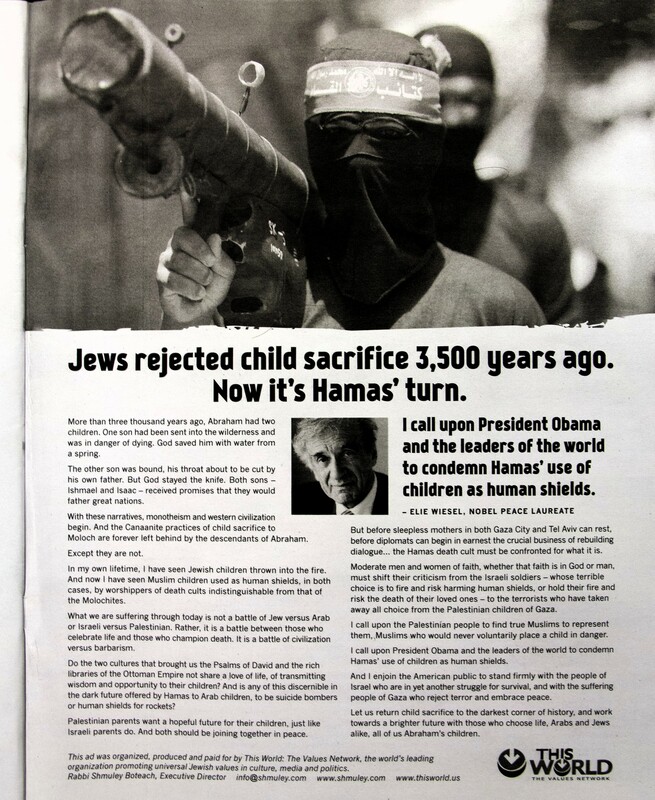 Yet, by agreeing to publish this provocative and defamatory ad you have sunken even further transgressing the boundaries not only of ethical journalism but also of humanity itself. I strongly believe that your decision will lead to a large number of people cancelling their subscription to the paper. As a concluding remark I would like to mention that, as a newly born baby, I was also sacrificed to the Moloch and used as a human shield by my Holocaust survivors, Jewish parents. After all I was born in the HaKirya hospital, at the centre of Tel-Aviv’s most densely populated neighbourhood, a few yards from the headquarters of the Israeli army and from the Hamal (war cabinet, known in Israel as “the bunker”) where, currently, attacks on Gaza are planned and monitored. Until 1998 the large birthing center where I was born, HaKirya Maternity Hospital, was still operating. It was closed when the newer Lis Maternity Hospital was opened in the adjacent Tel Aviv Sourasky Medical Center, commonly referred to as Ichilov Hospital. Palestine are the innocent ones. You have to be sick in the head to think they are terrorists. How many children of #israel killed by HAMAS am sure none. than why you have posted this topic. Well and as far as Palestine is concerned it has been proved since 48 by UN and other media resources that Israel is killing innocent people including children which means they are still sacrificing the life's of children but not their own blood. thats a shame !! Who calls the shots at the Guardian? I've just learned that Jonathan Freedland was appointed editor of the Guardian Comment section- presumably with oversight at Comment is Free- in May of this year. Freedland is a prominent Zionist, BBC presenter, and outspoken advocate for the cause of Israel. I don't think I'm alone in detecting a chilling effect coming into play around that time on comment threads relating to Israel/Palestine. The level of censorship, always high, seemed to redouble in force and frequency. Curiously, posts which cited authors, thinkers and dissidents from within Israeli society began to disappear at a higher rate. Ordinary "moderators"- journalism students just entering the profession, probably working as unpaid interns, would be unlikely to recognise the names of such figures or the significance of their positions. Thus, they wouldn't recognise the ideological danger to the present regime in heterodox Jewish views. But someone like Jonathan Freedland would. I find myself wondering whether a list of topics and references was drawn up and distributed, underscored with the legend, "Forbidden". Specifically, I note that Freedland seems not to have publicly addressed the matter of this reprehensible piece of propaganda published in the Guardian. Perhaps readers would consider contacting him for a clarification of his role, if any. Finally, the paper in recent years has undergone a cultural reorientation towards an American audience and American advertisers. Alignment with Zionist norms prevailing in the US would seem to be a part of that business strategy. I am confounded that a paper I respected for would publish this piece of propaganda. IDF uses a handcuffed teenager as a human shield while shooting at other teenagers for throwing stones. UN criticises Israel for using children as human shields to clear buildings, stand in front of military vehicles, and check suspect bags. A 13 year old boy was beaten then tied to the front of an IDF vehicle, left there for 4 hours.